This event is a wonderful opportunity to meet the reclusive Anderson Valley winery owners and winemakers up close and personal. Held under the big tent at Goldeneye Winery in Philo, this year’s tasting was threatened by rain, but the skies cleared through most of the afternoon and the cool weather made a perfect opportunity to indulge in great Pinot Noir. 56 wineries were pouring current releases, library wines and barrel samples of Anderson Valley Pinot Noir, and unlike many similar walk-around tastings, the crowd was mellow and not so overwhelming as to prevent easy access to each winery’s booth. One feature of the Anderson Valley Grand Tasting that sets it apart is the annual unique artwork of Gerald Reis of Design Studio in Cloverdale that commemorates each festival. His festival poster artwork from this and past year’s events is available for purchase at www.reisdesign.com. 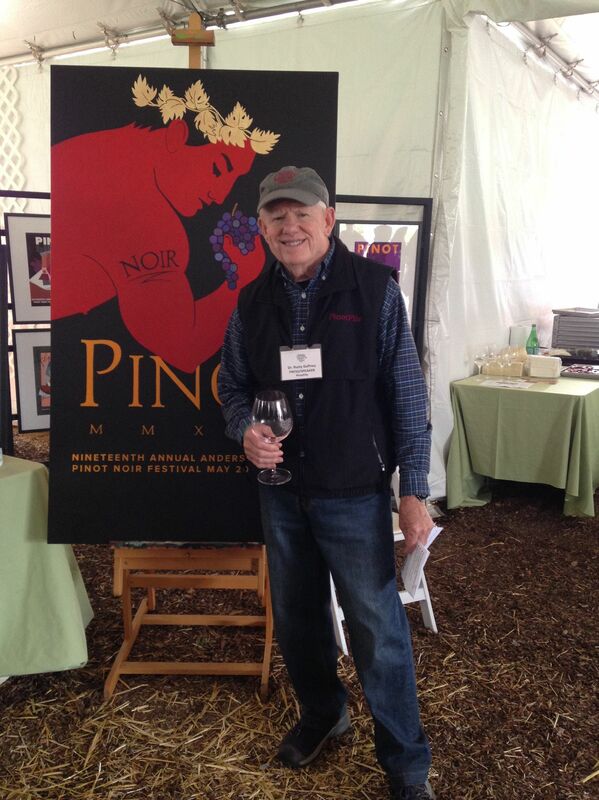 There were a few Pinots that stood out at the Grand Tasting: 2014 Drew Family Cellars Fog Eater, 2014 Drew Family Cellars Balo Vineyard, 2011, 2012 and 2012 Elke Vineyards Donnelly Creek Vineyard, 2014 Lazy Creek Vineyards Estate, and 2013 Twomey Cellars Monument Vineyard and 2014 Twomey Cellars Anderson Valley Pinot Noir. New faces that show tremendous promise included Ardzrooni Family Wines, Jaxon Keys Winery, Pangloss Cellars, Pennyroyal Farm, Quince Winery and Roma’s Vineyard. 20th Annual Anderson Valley Pinot Noir Festival, May 19-21, 2017. Stay connected by visiting www.avwines.com.